Magnet to magnet contact is going to be the strongest hold. In most cases, unless you have a really strong magnet, or a poorly sized hole and a bad glue job, everything will stay where you put it. Is magnetization as easy as drill hole and glue in magnet? Do I need to cover them with green stuff or something to prevent the pieces coming apart and leaving a magnet behind? If your hole is the right size, and the glue is good enough, generally drill hole, glue in magnet will be enough. 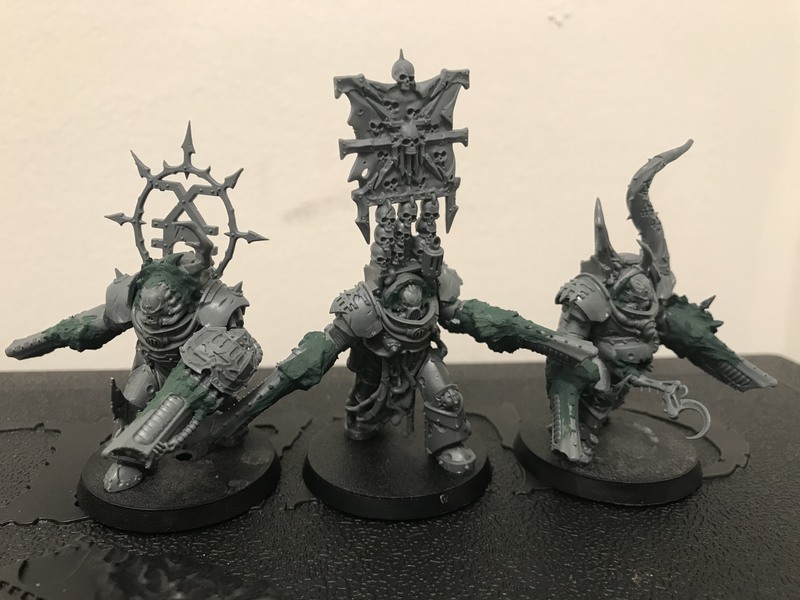 I kept getting sniped by 25 cents on all the Obliterator auctions on eBay so I ordered some bits and made my own damn Obliterators. 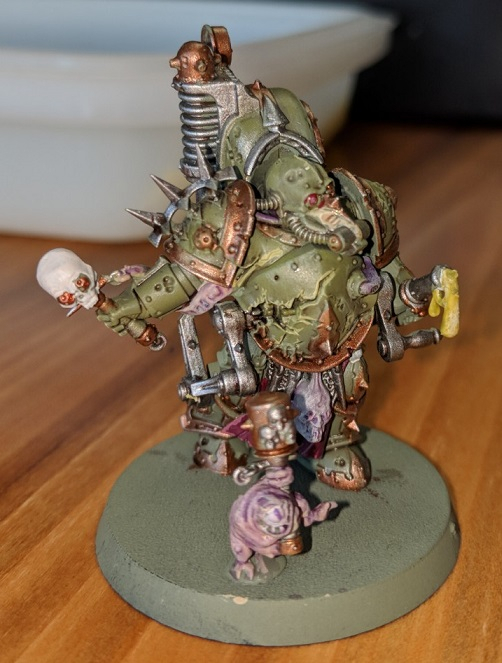 Nurgle terminator bodies are bigger and mutated, so they seemed like the best base. Just be sure your magnet polarities are right before you glue. Otherwise your pieces will never, ever, stay together. Is it necessary to go magnet to magnet? Or could you put a magnetic pin in the lighter bit so you didn't have to worry about polarities? Depends on how heavy that part with the pin is, how big/powerful the magnet is, and how big the ferrous pin is. Point of order: If you've got a part that's weighted funny that you're magnetizing, it helps to either have the parts align in a way that causes extra friction (like a part of the arm collides with the torso), or otherwise put in a retaining pin alongside the magnet to prevent things from spinning in place. 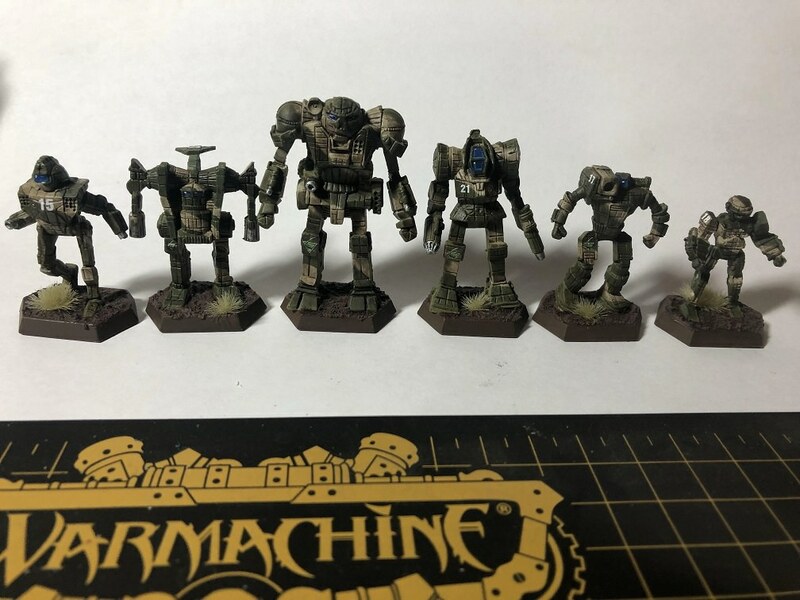 I magnetized a couple of Battletech miniatures, and some of the arm-pods that normally should be hoisted up over the body of the 'Mech tend to droop and swing down 180 degrees from where they belong. :/ Gotta go back and fix those yet. I am the slowest painter, I swear. 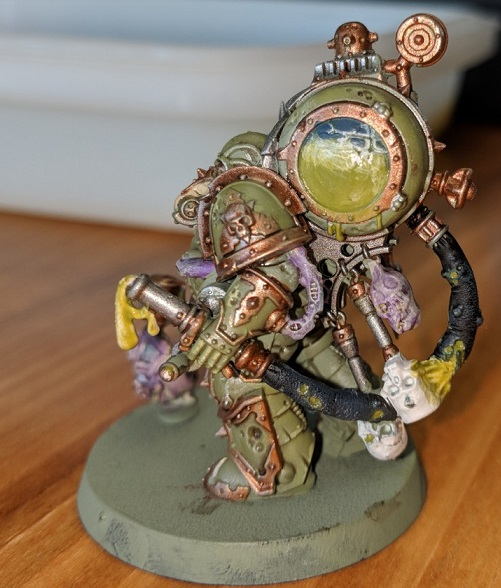 I've used magnetic paint on my dreadnaught arms, so that I didn't have to worry about polarities while being able to use any arm with any dread. Using metal snips to cut out pieces of can lid has also worked to give me surfaces that I don't have to worry about polarity for. I've always been afraid to magnetize my terminators specifically because I saw so many folks with droopy arms that slowly swung down from their cool position to point at the ground during the course of a game. You know you're cursing your rolls by having your guys point their guns at the ground. Terminators are definitely at the point where I just don't see any benefit to putting in the effort to magnetize. Just paint up another terminator. Things like the dreadnought where you've got so many different configurable options achieved just by swapping weapon arms, or predators, where one magnet on the sponson gives you multiple options makes more sense. 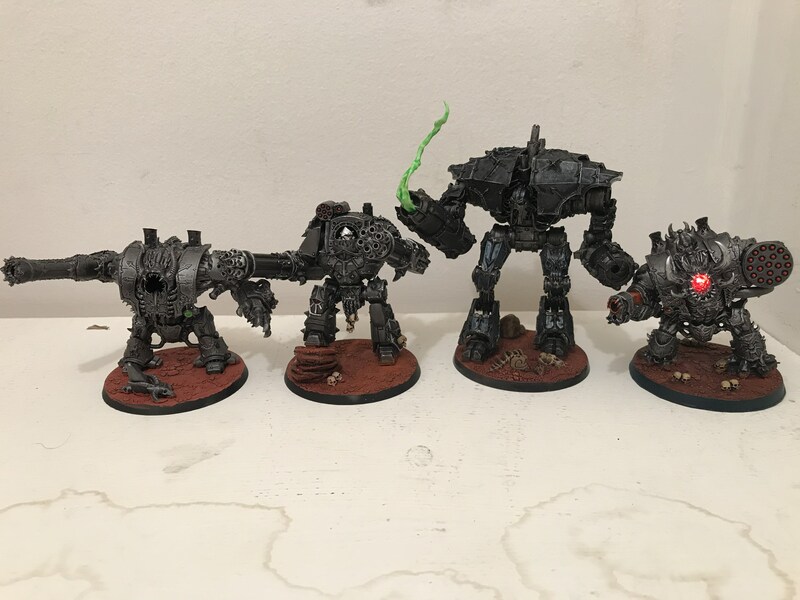 I do understand why some people magnet their terminators and vehicles as do I really want to buy another box since it is a deep price point for some of it just so I can have a different option for weapons? Hey all! For thinning Vallejo metal (model color) paints, what’s recommended? I tried Lahmian medium and it separate the particles too much while water dries too quickly and leads to clumps. I also read that using airbrush thinner from Vallejo works, and it is better than the above options, but still results in chunky bits every once in awhile. 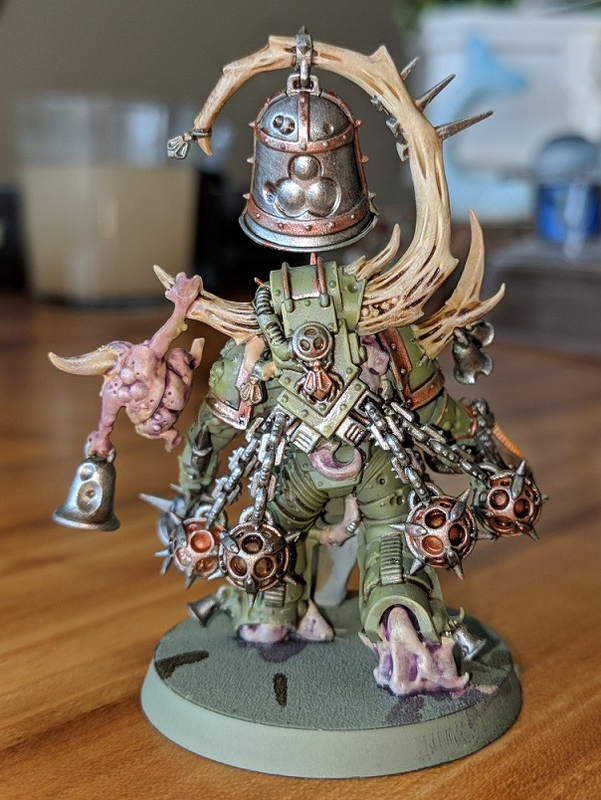 Next model completed in my Deathguard warband! The Foul Blightcaller.... he's not the most useful character on the field, but he's one of my favorites for looks. 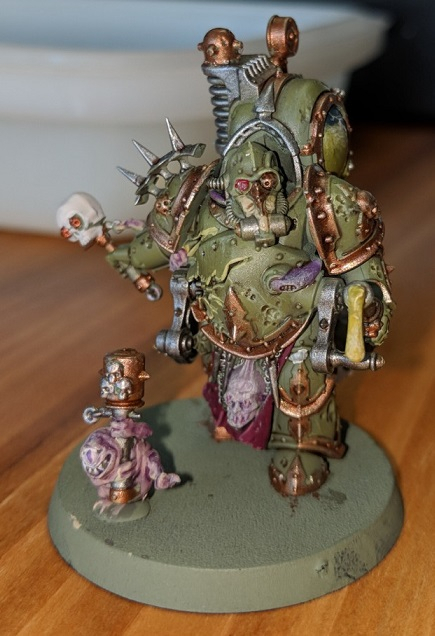 The second of the Foul Blight Bros.. the Foul Blightspawn. 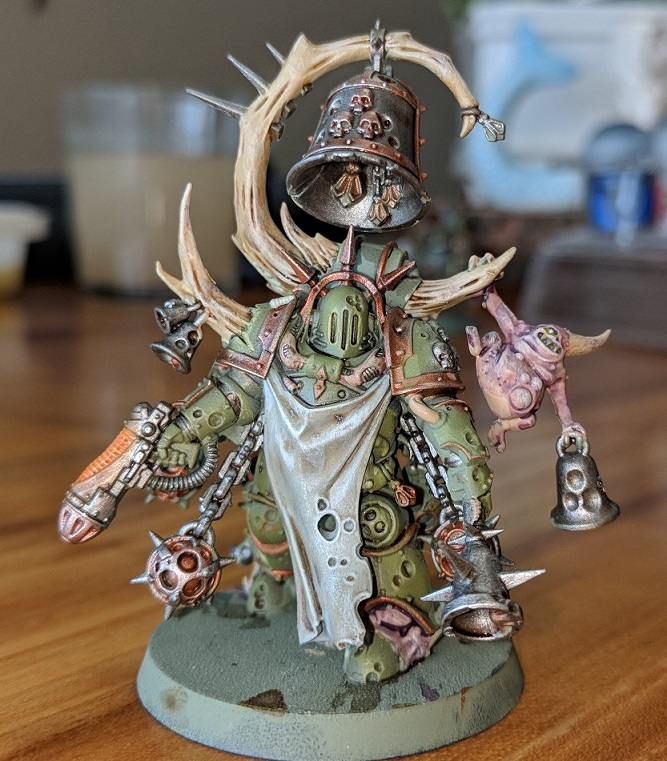 Fairly satisfied with this guy, but I could not for the life of me get the tank on his back to look the way I think it should. Also might redo his eye lens... couldn't get that right either, as it's microscopic. Still, pretty happy. The camera doesn't show it, but the nurgles rot technical is on all the snotty bits and it's very glossy and gross. Yeah that may work, I had assumed lahmian medium was the same thing. To be honest it’s the first time I’ve used anything other than paint and water with a brush. It’s like discovering a whole new world. When I first used a bit of lahmian medium with non metallic paint I was stunned at how easy it was to get the consistency I needed. One more Blight Bros shot that's hopefully a little less close up and gritty... just because. I need a lightbox or whatever they're called. You also need finished bases, because man you are robbing yourself right now. Great paint jobs throughout. Just seal the deal. 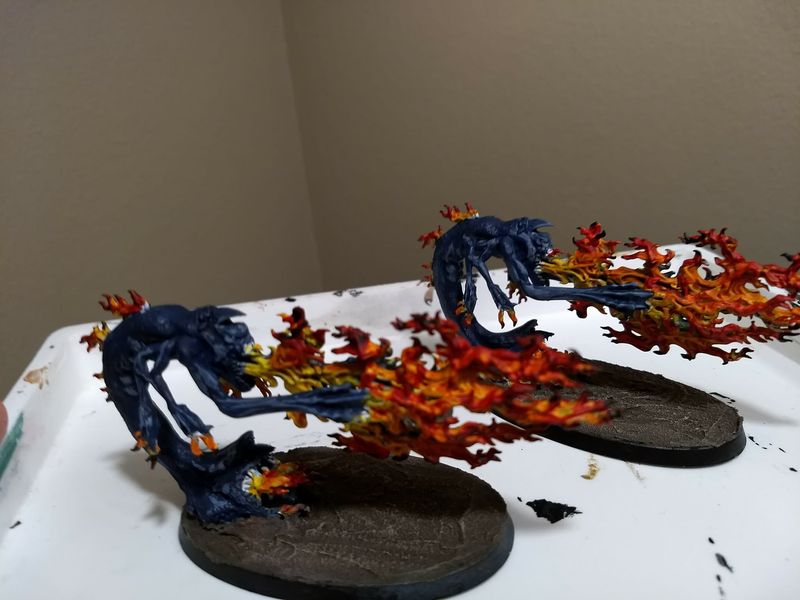 I can't decide how to base them! A pale ash desert, stained with a trail of unidentifiable goo behind them, sprouting mushrooms and whatnot. You already have nurgles rot so your 50% there. Apply texture paint for the colour you want (I went with astrogranite debris), wash and dry brush as appropriate. Paint areas in Caliban green. 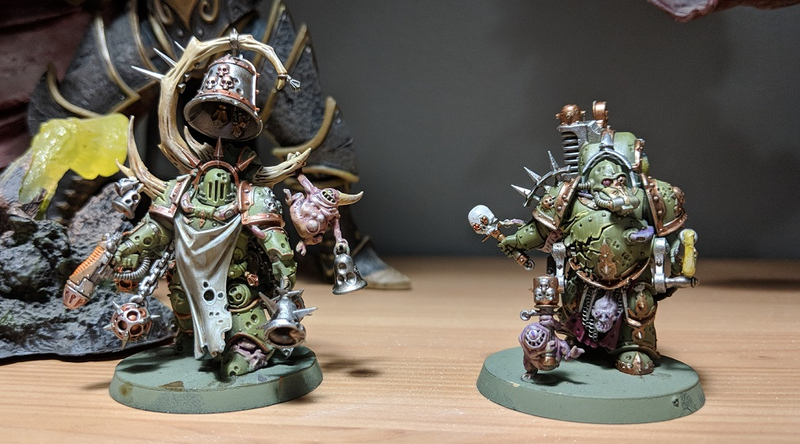 Apply multiple coats of nurgles rot to green areas. An example in the spoiler. Sold off 4 evil robobots to make some room and a little cash. 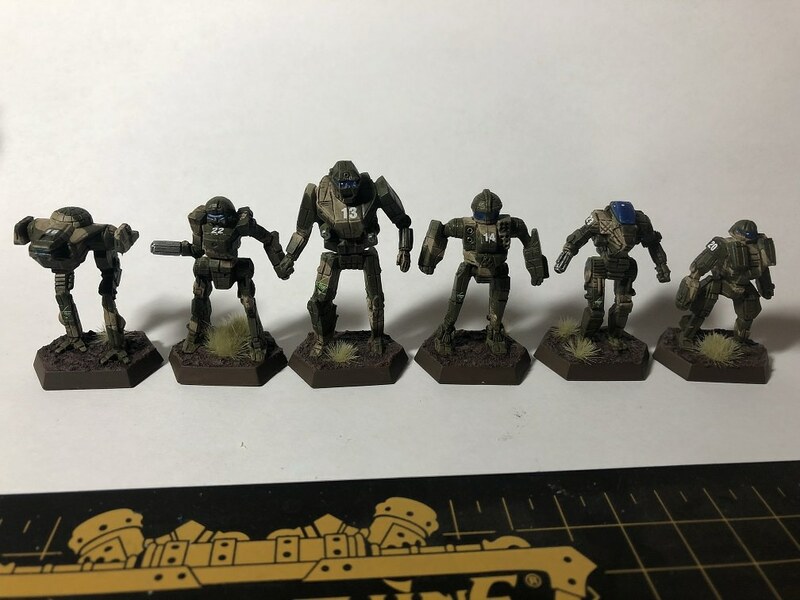 Had one person comment that they wanted one of them due to it being a pretty easy canvas to put their own colors over, and it makes me wonder if there’d be a market for generic paint jobs like this. Hm, that's not a bad business idea. Paint everything but the "colour plates". 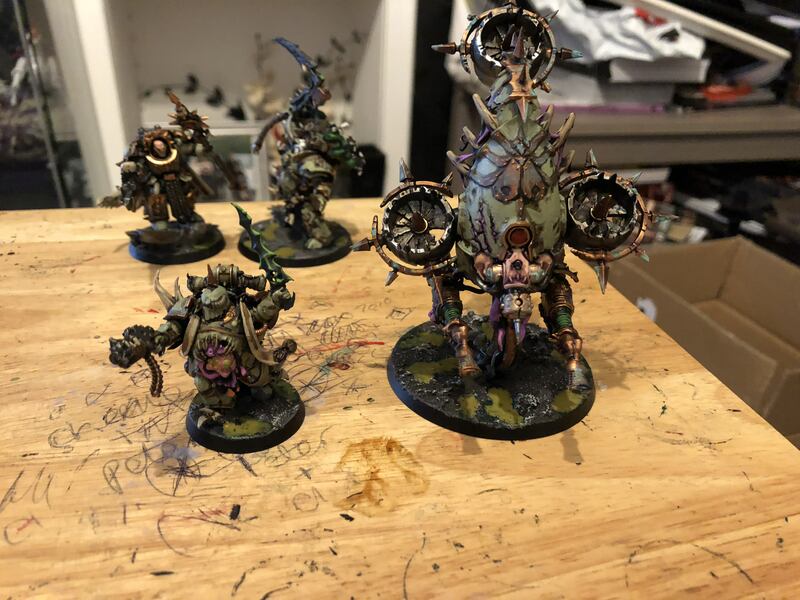 These are both solid plans, and I like the look of the nurgle pools... I think that's going to happen for sure. This is why I spend all my disposable income in US online stores. Painting up a ride for my Sorcerer, not sure if I just want to leave it like this or do some extra details. I kinda like it just being an evil cloud he flies around on. I recently received my Sotar 20/20. And tonight I finally used it to apply some yellow to my Lysander. As I was playing with it with only air, and then after when I was cleaning with alcohol, bubbles started forming around the tip. There are two ring-type pieces that screw on. They are as handtight as I can get them, but this foaming bubble stuff started coming feo m the ring where they screw together. Not feo m where the needle emerges from the brush. It's hard to see in the pic. Any idea how to stop this? Also, this is after I cleaned it. Notice the yellow at the bottom near the front hole, where the needle goes thru? I can't seem to get that out with a cotton swab and I'm afraid to put anything harder in there. Is that okay? You might have dried paint on the inside of the rings where they screw on that are keeping it from making a perfect seal. Soak all those bits overnight then scrub them. Otherwise it might be a cracked rubber seal somewhere, I haven’t used that particular brush before. If you’re worried about scratching the reservoir cup cleaning that stuff out try using ceramic picks, but it’s not gonna be hurt by much. Some windex for a second should loosen it enough to dig out normally. Also, run the needle in and out a few times with some windex in there and see if anything pops out from either side of the cup, there’s probably gunk in there too. I don't believe it has rubber seals. And it was doing it before paint ever went in there. When paint was being sprayed thru the brush was the only time it didn't bubble up. Have you tried turning it off and turning it back on again? I'm not quite kidding. Have you taken it apart and checked it, and put it back together again? I had a bubbling problem with my Grex, and it turned out I hadn't quite seated the needle all the way in before tightening the holding nut. You also might have built up some dried paint on the needle itself or near the tip that is preventing things from sealing the way they are supposed to, and so air is going where it's not supposed to be. Lighting the @Dr_Keenbean signal, because IIRC, he has some stripe of Sotar as well and might have some further input on this. I'm sure Tzeentch has the spiciest of mustards. For reals though, these are way better than my attempts at fire at least. First Blood Bowl tournament this weekend and I still have to do all the highlighting on the armour parts, the gems, shoes, eyes, leather parts, and some corrections on the Elf team. I'm too slow for this. I don't think I'll even get around to the decals and varnish. Ugh. I also made some dubious hair colour choices at well past midnight. RE dried paint in an airbrush - My cleaning process revolves around toothpicks at the moment. That might change when I get my new airbrushes and they have smaller tips, but for the moment they're perfect for cleaning out the 105. At any rate, it'll still work fine on the cup. You can poke and rub away with them and you're not going to put a scuff in the metal. Clarification: Before I put paint in it, I was blowing air to get a feel for how to set the chuck and it was bubbling moisture where those two rings screw together. I took it apart (removed the needle, and unscrewed those two rings, then removed the tip), and put it back together, and it seemed okay until I was cleaning it with alcohol, and it started bubbling again. I also sent a message to Badger to see if they have any ideas. 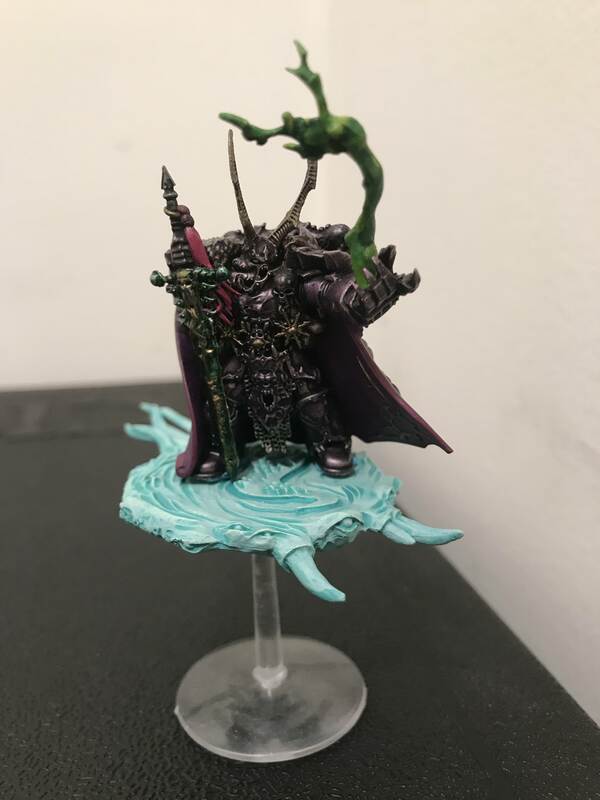 The Idoneth Deepkin are finally an army that could get me in Age of Sigmar. I liked the Old World of Fantasy, but did not like the setting of AoS. This army though, whoof.